For many bloggers, creating a blog post involves just opening the WordPress editor and typing. But organizing your blog posts as you’re writing them is a challenge for most bloggers. By helping you centralize your research and fragmented ideas in one place, Scrivener can help you manage the entire process of creating your blog content. Scrivener has long been the “go-to” choice for novelists, but now other writers are discovering its advantages. If you’re writing long, comprehensive blog posts — and you should be — Scrivener can help you streamline your content creation workflow. By making it easier to write in smaller chunks — and allowing you to change their order later — you spend less time worrying about organization and more time just writing. Scrivener shares some similarities with popular programs like Microsoft Word or Libreoffice, but it has special features not found in pedestrian word processors. The program starts you off with a full-featured outliner to manage the structure of your blog post, and then makes the process more manageable by letting you edit one section at a time. You can easily rearrange entire sections — unlike in a word processor where it can be clumsy and awkward to do so. Within the outliner, you can see the section title, synopsis, when it was last modified, and the word count. Scrivener makes it easy to jump between a content synopsis displayed on a “corkboard,” your post outliner and the text editor. Scrivener’s hierarchy — projects, folders, and documents — can also be customized to suit your needs. If you manage several blogs, you can assign a project name to each one and use folders to organize documents by subtopic. Another popular way to organize your posts is to assign each year as a project and use folders to organize by month. Gwen Hernandez is the author of Scrivener For Dummies and offers beginner, intermediate and advanced Scrivener courses online. Hernandez organizes her posts by year and month, but she’s quick to point out that it’s not the only way you can set it up. 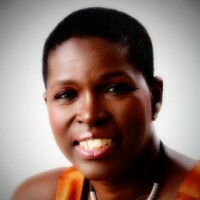 “I can quickly look back at what I wrote for Mother’s Day 2012, or what I was talking about last July,” she says. “There are lots of other ways to organize your posts: by subject, target site/market, or even status.” Scrivener allows you to assign a “status” to each of your posts such as idea, work-in-progress, complete, and submitted/posted. “I can color code and tag my posts. 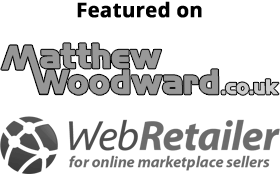 I use the Label field to keep track of which website the post was written for (my personal blog, my group blog, or a guest site). This way, I can quickly tell by color where it is. The Status field is how I tag whether the post has potential to become a newsletter or magazine article, and its submission status. Scrivener makes it a cinch to search for posts that fall into a specific value, for example, all posts which have newsletter potential but haven’t yet been submitted,” Hernandez says. Keeping track of your writing statistics is also straightforward. “With a single click, I can tell how many blog words I’ve written in a specific month, year, or for as long as I’ve been blogging,” she says. “In Scrivener, it’s simple to store—and link to—supporting materials, research, images, ideas, notes, and web sites. Everything is contained in one place,” she says. 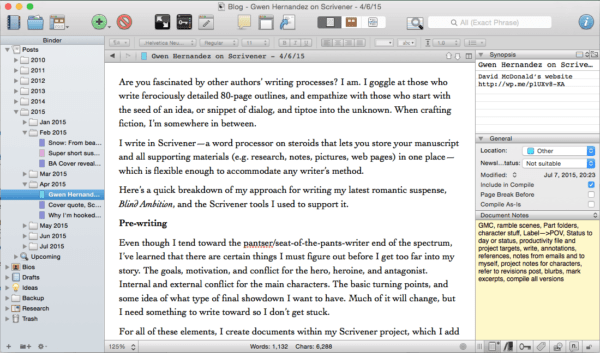 Scrivener shines by “getting out of the way” with its distraction-free composition window, but it also has advanced features for power users. 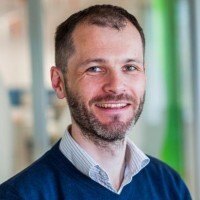 “The ability to manipulate your manuscript on a modular level — dragging and dropping individual chunks to wherever you see fit — completely changed the way that I wrote long and short-form documents,” he says. 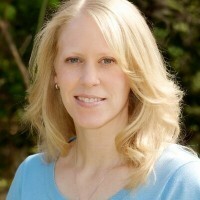 Sharon Hurley Hall, a professional writer and blogger, says she uses Scrivener for tracking blog posts and articles she writes for herself and her clients. “Overall, using Scrivener has revolutionized my writing workflow and I can’t imagine using anything else,” she says. She has to organize research in ways that are quickly accessible during the writing process, especially when working on ghostblogging projects. “Labels and status help me organize work by topic and where it is in the workflow, and the Research section is great for storing stats I’m likely to use for multiple articles. For example, since I write about social media, when there’s a new study on usage, demographics or something similar, I can import the document into Scrivener and it’s there offline so I can refer to it whenever I need it,” she says. 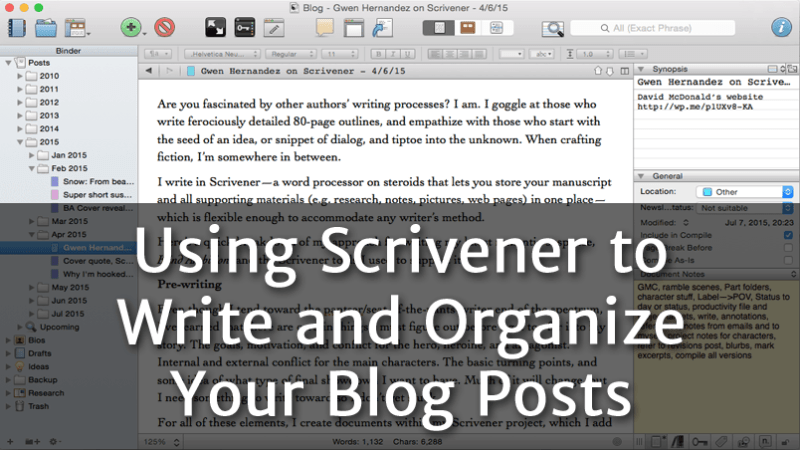 As important as writing, getting your content out of Scrivener is also easy. Scrivener also includes a variety of export options for bloggers. 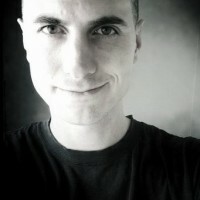 Bryan Collins, author of A Handbook for the Productive Writer, says that while Scrivener is a powerful project management tool, its export options can really make a writer’s life easier. He says that the software makes it simple to streamline conversion into digital formats such as EPUB and PDF. Collins thinks that Scrivener is about as close to a perfect content creation environment you can get. “If you’re a writer, you can live in Scrivener,” he says. 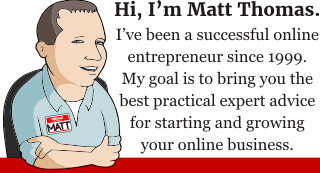 As a successful online entrepreneur since 1999, I'm happy to offer you my personal experience and practical expert advice to help you start and grow your online business. Contact me or follow @insidersecrets. Great post. 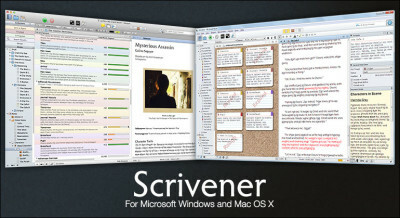 Scrivener is one of my favourite writing apps. Thank for including me Matt.